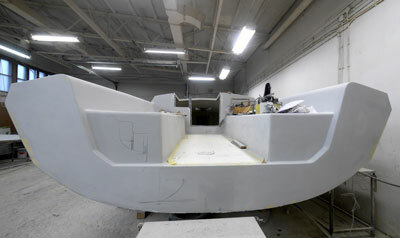 The Bente 24 (24.6’/7.5m), an open-transom, hard-chine hullform, was in some respects the product of a social media experiment, in which Facebook followers joined in on the project. Stephen Boden, 47, a native of Hamburg, Germany, and author of two books on minimalist cruising aboard small sailboats, decided that to venture farther than his 18‘ (5.4m) model would take him, he needed something around 24‘ (7.3m). With Alexander Vrolijk (son of yacht designer Rolf Vrolijk) and Jan Kuhnert, both of Judel/Vrolijk & Co., Hamburg, Germany, and a bottle of Bordeaux, they conceived what Boden describes as “a small, fast sailing ship that would be racy but yet affordable. Simple and inexpensive, yet very seaworthy. 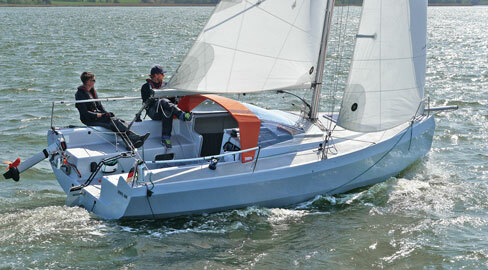 The Bente 24 features a hard-chine, open transom hull design. Facebook followers, who numbered more than 2,000, also contributed ideas on the project as it progressed. Once the design was complete, a prototype hull (without rig and appendages) was exhibited at the 2014 Hamburg International Boat Show and drew considerable interest. 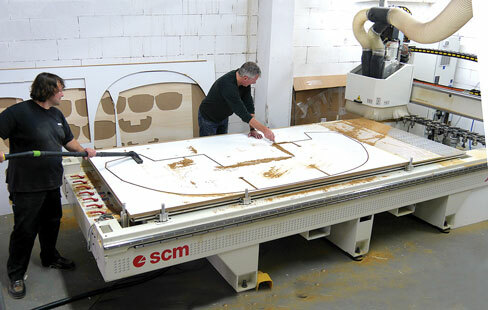 Frames for the Bente 24 prototype were CNC-cut on a table. Then a builder for the hard-chine, open-transom hullform was sought and found: Yacht Service in S´wiatowida, Poland, which also makes hulls for X-Yachts and numerous others. Production was scheduled to begin in August 2015, employing infusion and a foam kit from DIAB with Divinycell HM80, Divinycell Matrix 10-8, and Divinycell PX300. The boat will have a cast-iron lifting keel with lead bulb. Auxiliary power is a Torqeedo electric outboard. LOA 7.5m (24.6‘), LWL 7.15m (23.5‘), beam 2.75m (9‘), draft 1.5–1.8m (4.9‘–5.9‘), displacement 1,200 kg (2,640 lbs), mainsail 22m2 (237 sq ft), jib 11m2 (118 sq ft), €25,000 excluding VAT ($28,220). Bente UG (haftungsbeschränkt), Hohenstaufenstr. 40, 27570 Bremerhaven, Germany, website www.bente24.com.